If you work in retail development or commercial real estate, you are constantly on the go, looking for new locations to expand your business or help your client find the right location for their next venture. Using your iOS or Android mobile device and an app from Esri, you can now quickly tap into market insights to find the best location for a new restaurant, market, or store. 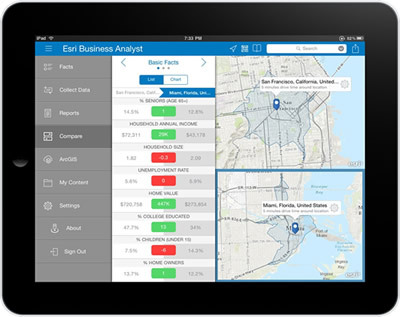 The Esri Business Analyst Online mobile app (BAO Mobile) gives you a new way to answer questions with instant access to key demographic and market data no matter where you are—traveling to a business meeting, visiting customers, or inspecting a potential development site. You can make decisions faster and present your findings in the field or in the office, using your mobile devices. 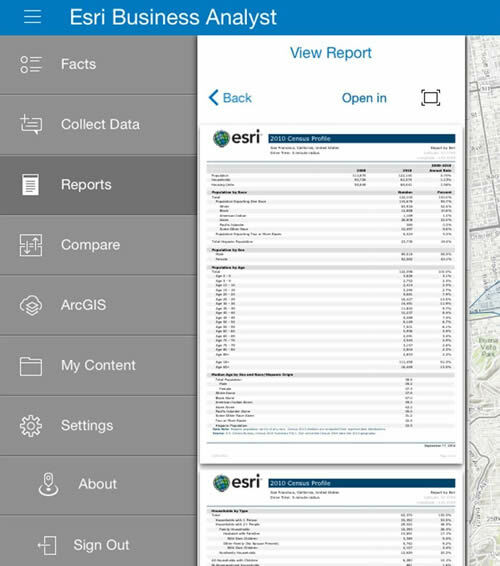 The app helps you evaluate sites, trade areas, or neighborhoods for more than 135 countries, using a large collection of datasets including population, income, market potential, and consumer behavior. Set site properties and search criteria. You can customize your settings for creating drive-time areas or rings according to the market area of interest. With the Smart Map Search capability, you can refine your target data ranges and pinpoint locations that meet specific population and age criteria. Compare sites using data and charts. You can display important facts about two locations side by side and decide which site is more suitable for your target market. Or you can analyze the trade area around a prospective site and compare information about any address with another address. You can find key market facts for specific areas such as around 380 New York Street in Redlands, California. Here, the app has generated a one-mile radius market area around 380 New York Street. Access global data for more than 135 countries. You can search for information on people's income, age, spending, and market potential in various international locations. Data variables are available depending on the country you are exploring. You also have access to the most recent US demographic data (2014/2019). Get reports. Generate preformatted reports such as demographic profiles, restaurant market potential, net worth profile, and site maps for global locations. You can share these reports with a broad audience via e-mail. Receive the complimentary app with your BAO subscription. BAO Mobile is a companion app that is included with your BAO subscription. With BAO, you can create custom reports and share them throughout your organization. You can access the BAO Mobile app using the same ArcGIS Online credentials that you use for BAO. If you don't have a BAO subscription, sign up for a free trial. Download the BAO Mobile app from the Apple App Store or Google Play and get critical business insight that matters.